Dominique Ansel’s Latest Soft Serve Is Cold-Brew-Flavored“It’s completely different from coffee ice cream: richer when it comes to flavor, without being bitter or sour,” Ansel says. 12 Brand-New Ice-Cream Flavors Worth Tracking Down This SpringMorgenstern’s charred chocolate eggplant, Superiority Burger’s expanded vegan offerings, and Mah-Ze-Dahr’s housemade soft serve. Close Out the Summer Eating As Much Corn Ice Cream As You CanIt’s basically the perfect flavor this time of year. Two Pastry Experts Dreamed Up This New Ice-Cream TacoCorn ice cream, a masa-waffle shell, and roasted corn caramel. Two Famed Chefs Have Introduced Hot-Dog Ice CreamAnd it’s exactly what it sounds like. Introducing the Pie Sundae, Which You Can Go and Eat ​Right NowIt’s a collaboration with Bubby’s High Line, its next-door neighbor. Rejoice, It’s Free Cone Day at Ben & Jerry’sWhat will it be: Chunky Monkey or Cherry Garcia? Ben & Jerry’s Unveils Its First-Ever Nondairy Ice CreamsTwo classics (Chocolate Fudge Brownie and Chunky Monkey) and two exclusive new flavors. There Will Be Free Scoops at Van Leeuwen’s Brand-New Williamsburg StoreThe flagship is now open on Wythe Avenue. Introducing the J-Cone, New York’s Kookiest New Novelty Ice CreamThe J-Play ice-cream truck specializes in cones made of puffed corn. Maman’s Using Its Superb Cookies for Ice-Cream SandwichesBrilliant idea. Dominique Ansel Kitchen Unleashes Burrata Ice Cream TomorrowPlus: a Gianduja flavor, with salted-hazelnut brittle and orange mist. Ben & Jerry’s Seeks to Save the Planet Through Ice CreamA new flavor, Save Our Swirled, will bring awareness to climate change. It’s Free Cone Day at Ben & Jerry’s!How about a scoop of Peanut Butter Half Baked, or Wayne Swirled? Now You Can Finally Buy Ice-Cream-Filled Thin MintsAn overdue collaboration between Good Humor and Girl Scouts. Davey’s Unleashes Red Velvet Oreo Ice CreamStarting this Friday. Momofuku Milk Bar Gives Birthday-Cake Soft-Serve the Attention It DeservesChristina Tosi steeps milk in actual vanilla cake. Morgenstern’s Collaborates With Cool Chefs on New Ice-Cream FlavorsJeepney, Estela, Navy, and Bun-ker are all on board. Bubby’s $100 ‘Kitchen Sink’ Sundae Has 16 Giant Scoops of IceFace plant. Introducing Momofuku Milk Bar’s Crack-Pie Soft-ServeNow available in the East Village. Introducing A.B. Biagi’s Literally Hot Ice-Cream SandwichIt¹s no longer enough to simply shove a scoop of artisanal ice cream between two cookies and call it a day. First Look at the Brand-New Soda Fountain at Bubby’s High LineSundaes! Malts! Shakes! Pie! Today Is Free Cone Day at Ben & Jerry’sIt’s a sacred nationwide holiday. Kanye’s New Album Is Gonna Be All ScreamoBased on remarks from Daft Punk and a crazy Met Gala performance. Humphry Slocombe Expands to the Ferry BuildingIt’s set to open in the fall. Yo Ku Mon and Island Monarch Coffee Coming to Culver CityThe two sister franchises promise ice cream sandwiches with house-made cookies and coffee roasted and brewed before your eyes. 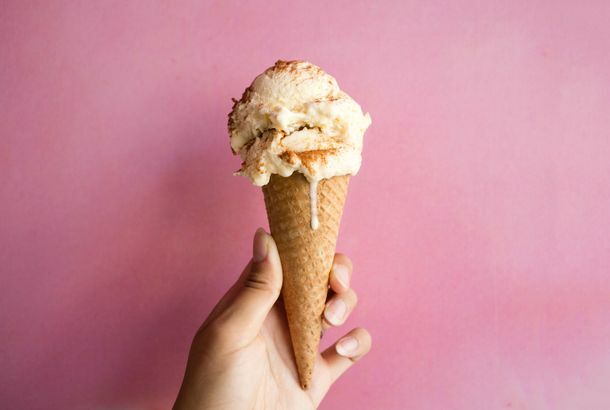 Now Open: Little Baby’s Ice Cream, Serving West Philly Frozen Treats FromDue to the last minute nature of the city and how it signs off on inspections, the shop opened unexpectedly over the weekend. It’s Free Cone Day at Ben & Jerry’s! Hooray!The most magical day of the year. Scream Sorbet Saved?Some investors may be intervening to reopen the shuttered shop. Pushing the Season: The Igloo Opens and Little Baby’s Ice Cream GetsThough Old Man Winter still has one last wallop left in him, brain-freeze fodder flourishes. Scream Sorbet Likely to CloseThe purveyors of creamy, yet dairy-free, excellent sorbet are in trouble. Three Twins Ice Cream Hopefully Reopening By Summer in Lower HaightSit tight! Now Open: Avenue Scoop, Serving Ice Cream and More on East Passyunk Ave.In addition to ice cream, the new shop serves waffles, coffee, and bagels. Big Gay Ice Cream Truck Rolling Through HollywoodAnd so far, it’s faaabulous! 2-For-1 Scoops at Sprinkles This WeekYou’re going to need it as long as the weather stays this hot. Shake Shack Hosts a Frigid Reception For DesignPhiladelphiaIn honor of the celebration of design, the burger joint’s rolling out free concretes. Drunken Udder Hits Fat DogBoth locations of the gastropub now have boozy ice cream. Brite Spot Catering to Echo Park’s Meatless Masses, Peddler’s Creamery Sets UpChef Darby Aldaco is ditching the frozen veggie burgers to make his own. Big Gay Pop-Up Bound For L.A.The New York ice cream sensation might team up with chefs from Animal and Kogi while visiting town in October. Sketch Ice Cream Reopens Today in Berkeley After Three-Year HiatusThey do soft-serve only, but it’s not for novelty’s sake. Scoops Now Open in Highland ParkThis has to be good news when it’s 20 degrees hotter than Scoops Westside. Bi-Rite Creamery Wants a ParkletIt would be right outside the soft-serve window. Beat the Heat With These Five Boozy Brain-FreezersSometimes regular old ice cream and popsicles just don’t cut it.